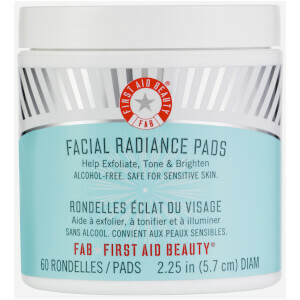 Perfect for all skin types, the First Aid Beauty FAB 'Faves to Go' Kit combines everything you need to achieve clear and radiant skin. In handy travel sized bottles, these 'FAB' faves will keep your skin cleansed, exfoliated and moisturised on the go. - K.N. Suitable for sensitive skin, this face cleanser gently but efficiently cleanses the skin, working to remove impurities, makeup and dirt to leave you with a crystal clear complexion. The pH balanced formula features a powerful blend of antioxidants which fight against free radicals to keep the skin healthy. Designed to be used daily to reduce flare ups and skin reactivity. Perfect for all skin types, even the most sensitive, these facial radiance pads work to effectively improve skin clarity and visibly reduce pores. Combining cucumber and Indian gooseberry with lemon peel and liquorice root, the toning pads professionally brighten and tone the skin whilst smoothing out the appearance of fine lines. Expect radiant, glowing skin with a more even complexion. Perfect for those exposed to harsh weather or living with severely dry skin, this repair cream delivers an unrivalled hydrating experience, helping to alleviate and visibly improve dry and scaly skin. Thick, rich and non-greasy, the emollient formula soothes agitated skin by penetrating deep down and immediately relieving distressed skin. Fortified with shea butter, colloidal oatmeal and soothing eucalyptus oil, the cream with added antioxidant booster and ceramides improves the natural barrier function of skin whilst helping to relieve irritation and itching caused by eczema. Defends from free radical damage and is suitable to use all over the body and face. *All free from parabens, harsh chemicals and colourants. Safe for sensitive skin. Dampen the face and dispense a dime-sized portion of cleanser onto fingertips. Delicately massage into all zones of the face. Remove with a soft wash cloth or a splash of water. Recommended for daily use in the am and pm. Wipe pad across face, neck and décolleté once or twice daily after cleansing. Apply as needed to face and elsewhere. Use at least twice daily to restore dry or irritated skin. FAB Face Cleanser: Water (Aqua), SodiumCocoyl Isethionate, Glycerin, Stearic Acid, Aloe Barbadensis Leaf Juice, Stearyl Alcohol,Sodium PCA, Camellia Sinensis Leaf Extract, Chrysanthemum Parthenium (Feverfew) Extract, Glycyrrhiza Glabra (Licorice) Root Extract, Allantoin, Hydroxypropyl Methylcellulose, Disodium Cocoamphodiacetate,Coco Glucoside, Glyceryl Stearate, Disodium EDTA, Caprylyl Glycol, Phenoxyethanol. FAB Facial Radiance Pads: Water/Eau, Aloe Barbadensis Leaf Juice, Glycerin, Cucumis Sativus (Cucumber) Fruit Water, Lactic Acid, Glycolic Acid, Sodium Hydroxide, Leuconostoc/Radish Root Ferment Filtrate, Camellia Sinensis (White Tea) Leaf Extract, Chrysanthemum Parthenium (Feverfew) Extract, Glycyrrhiza Glabra (Licorice) Root Extract, Citrus Medica Limonum (Lemon) Peel Extract, Citrus Nobilis (Mandarin Orange) Fruit Extract, Hyaluronic Acid, Phyllanthus Emblica (Indian Gooseberry) Fruit Extract, Polysorbate 20. 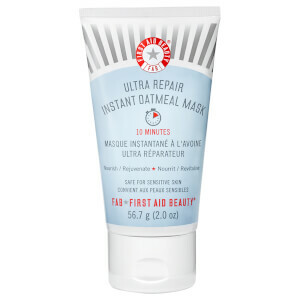 FAB Ultra Repair Cream: Colloidal Oatmeal 0.50%,Water, Stearic Acid, Glycerin, C12-15 Alkyl Benzoate, Caprylic/Capric Triglyceride,Glyceryl Stearate, Glyceryl Stearate SE, Cetearyl Alcohol, Caprylyl Glycol, Phenoxyethanol, Butyrospermum Parkii (Shea Butter), Squalane, Allantoin, Sodium Hydroxide, Dimethicone, Xanthan Gum, Disodium EDTA, Chrysanthemum Parthenium (Feverfew) Extract, Camellia Sinensis (White Tea) Leaf Extract, Butylene Glycol, Glycyrrhiza Glabra (Licorice) Root Extract, Eucalyptus Globulus, Ceramide 3. 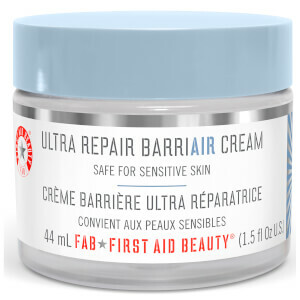 I discovered First Aid Beauty earlier in 2018 and as I have very dry and sensitive skin, I ordered the Ultra Repair Cream. I have a lot of trouble with so-called "ideal for sensitive skin types" products so I was over the moon when my skin was looking well hydrated and blemish free after only a few days and in the following 6 months I have continued to use the Ultra Repair twice a day on my face (and purchased another tube). When I saw the Fab Faves Kit I saw an opportunity to try a couple of other products from the range. I am loving the Radiance Pads so will be purchasing a full size version very soon! I live in New Zealand and shipping from overseas is usually exorbitantly high so I highly recommend Look Fantastic to all of my friends, family and colleagues due in part to the free shipping. As for First Aid Beauty products, they are now a holy grail for my skincare routine and have replaced the high end products which often irritated my sensitive skin. Yes,I recommend this product and definitely purchased it again.It really works on my dry skin.Love it! I bought this kit instead of buying 1 First Aid product because I heard a lot about this brand but I was still hesitant to try which product i should get. Then i found this kit and im very glad that i got this. This included 3 products that i was excited to try out and i was surprised to see the decent product size this kit gave us. I would definitely purchase again along with full size products. I had read a few reviews of the FAB range and I was interested to give it a try. My skin is fairly sensitive and I am prone to redness when my skin reacts to products. The facewash leaves my skin feeling clean, removes eye make up and doesn't cause any tingling or redness, I've actually been looking forward to washing my face! It lathers well and a little goes a long way. Great sizes in this set to trial the products and good for travelling. The moisturiser is very soothing and moisturising, it's relieved my flakiness on my cheeks. It leaves skin looking good and I've found it to be a great base for make up. I'm definitely going to buy the full sizes of the face wash and moisturiser, I'm still not quite convinced on the toner pads though. I like these kind of sets where you can try several products for a decent price. 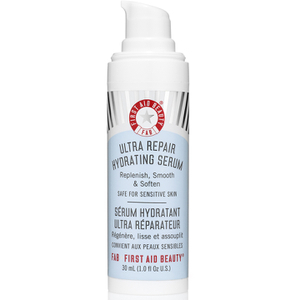 I have very dry skin so I loved the ultra repair cream immediately. It has a scent to it but that doesn't bother me at all. My skin is less flaky and very soft in the morning after using it at night. It is to heavy to use under your makeup so I only use it as my night moisturizer. The cleanser is great and removes mostly all of my makeup. Nothing bad to say about it, but I have my purity cleanser that works better. I was looking forward to use the cleasing wipes and see how much of a difference it could make on my skin. I have a couple of bumps on my cheeks and it helped to make them less visible. Not al lot though. I was noticing a difference on my forehead, where the bumps where less then before. It didn't WOW me though. I didn't made a difference like I thought and expected it would make. Overall, I liked the cleanser and the cleansing wipes but wouldn't repurchase them. However, I would repurchase the ultra repair cream as soon as I run out of it. I bought this last year to take on holiday with me as we're perfect sized products to travel with! Iv tried quite a few different products from first aid beauty and I have to say that overall I'm really impressed with the brand and the products they offer! Also made with great ingredients paraben free etc! Iv just recently repurchased this as I thought it would be a lovely Christmas gift for a member of my family! Also lookfantastics delivery is always pretty quick and reliable which is always a bonus when ordering online! This package is now only this piece of cotton has the effect of dispelling.